There’s nothing quite like the smell of something baking in the oven to conjure up warm memories. When I was about 12, my Grandmother taught me how to make my first cake and it was a disaster. I was crushed! What I remember about it was the big sunken hole in the middle but more importantly, how kind she was in reassuring me that eventually I’d get it right. I went forward and have made thousands of cakes, breads, cookies, and everything else in between. For the past several years, I have been experimenting with wheat and dairy free baked goods, which here in Ireland it seems to be the rage as coeliac disease and wheat intolerance is in high numbers. In my determination to create a really good gluten free bread I tried a variation on the brown bread from Coming Home To Cook. We baked it in my second gluten free cookery class here at Boghill. It’s tasty and moist and it dosen’t get dried out in a few days as other gf breads I’ve tried. Enjoy! Preheat oven to 180c or 350f Grease and flour a bread tin. In a large mixing bowl combine 1/2 cup gf white bread flour blend or brown rice flour with 1 cup buckwheat flour, 1 -1/2 cups toasted soy bran, 1/2 tsp. bread (baking) soda, 1/2 tsp. gf baking powder, 1-1/2 Tbl. dark brown sugar, 1 Tbl. crushed flax seeds, 2 Tbl. sunflower seeds. Crumble in 1 Tbl. soy butter. In a seperate bowl mix together 2 eggs with 1- 3/4 cups soy milk. Add wet ingredients to dry, mix with wooden spoon or your hands. Spoon into bread tin, top with a combination of gf flakes (such as quinoa, rice, buckwheat) and a Tbl. of sesame seeds. Bake about 40 minutes or until tester comes out clean. I have the pleasure of teaching 7 lovely women the art of baking and cooking gluten and dairy free in my new class at Boghill. Each week we will create an all purpose bread, suitable for sandwiches, toast, as a side with soup, salad, etc. A sweet treat and a vegetarian entree using non gluten grains rounds out the class. Many of the recipes I will use come from my book or this blog. 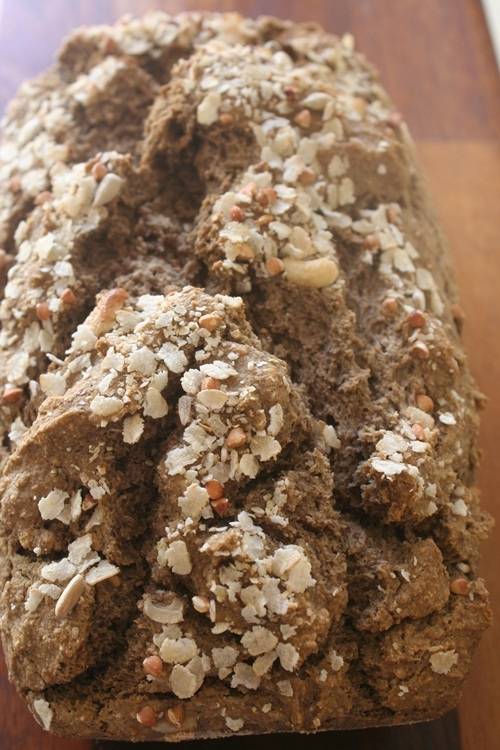 But, it’s fun creating new ones and seeing how many versions of brown bread we can come up with! Preheat oven to 180c or 350f. Grease and flour a bread tin. In a mixing bowl or food processor mix together 3 ripe bananas* with 1/2 cup pear apple spread or applesauce. Add 1/4 cup sunflower*. Beat in 2 eggs and 1 tsp. vanilla extract. Mix in 1 cup of brown rice flour or gf white bread flour mixand 1 cup buckwheat flour. Add 1 tsp. baking soda and 1/2 tsp. salt. Add dried fruit of choice: currants, raisins, dried cranberries add sweetmess. Spoon into bread tin, top with crushed walnuts or sunflower seeds and bake for 30 minutes or until tester comes out clean. Cool on wire rack. This is a good, healthy breakfast snack topped with soy cream cheese. *When I have overipe bananas I freeze them whole and use them for bread. Just pop the bananas in the freezer and take out a few hours before baking. Open the skins and the banana and juices come right out. Use the juices for this recipe and in juicing, yum! Always use a good vegetable oil in baking. Enjoy! 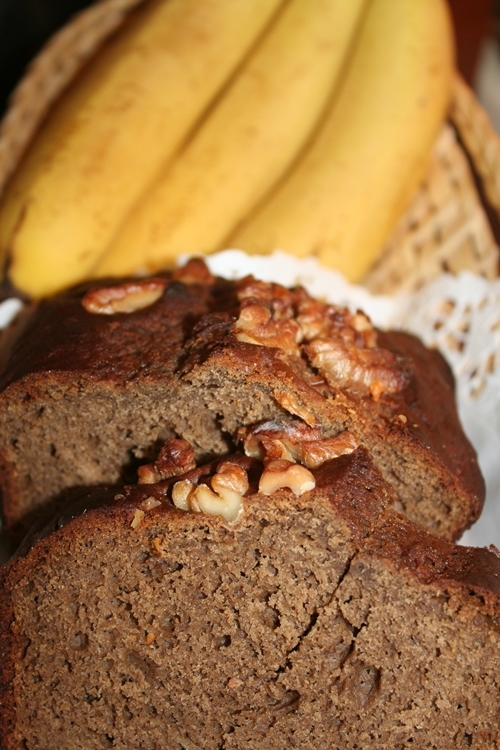 Comments Off on banana bread with a twist! It wasn’t much of a summer in Ireland. Grey clouds filled the sky most of the time, although we were spared from the deluge of rain we’ve had the past 4 summers that I’ve been here. 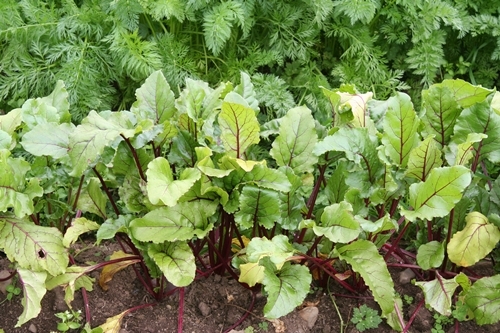 Some gardens thrived despite the lack of sun while others were given over to the slugs and are just now sprouting courgettes, kale and a variety of hearty greens. I was given these beans, lettuce and beetroot from Adva’s garden in Doolin, which has done really well and Kerrie, a friend and vegetarian cooking class student (past and present!) 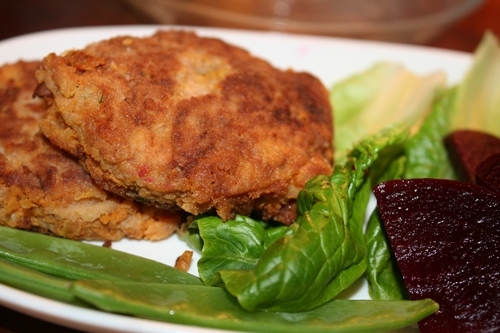 shared this delicious sweet potato patty recipe with me. I adapted it according to what I had in the cupboard and it is gluten and dairy free, perfect for trying out in my next gluten free cooking/baking class. Her recipe calls for mango chutney and ground almonds and I used a whole fresh mango, dried cranberries and ground walnuts (thinking of Thanksgiving already!) Make it your own style and enjoy! Roast or boil enough sweet potatoes to make 4 cups mashed. Peel, mash and let cool. In a mixing bowl add one cup ground walnuts, 1 egg, 1 chopped fresh mango, 1/2 cup of sauteed garlic (1 clove), celery and onion. Add 1/2 cup dried cranberries, 1 tsp. nutmeg, 1 tsp. cumin, sea salt and ground black pepper. Let sit for 15 minutes . Heat a little olive oil in a saute pan. Form patties and dredge in gluten free flour, I used brown rice flour. Saute on both sides until brown, lay on baking sheet and cook in a 180c or 350F oven for 20 minutes. Serve with a variety of raw vegetables and pickled beets. Yum!